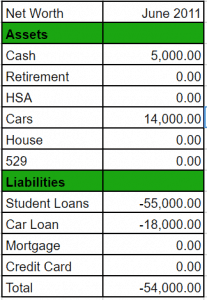 I track a few items each month related to my personal finances but the one that I look to most often is my net worth. I started back in 2015 and its gratifying to take the 10 minutes on the 1st of every month to see if my family and I took positive steps towards our goals. Here is what a plot of those numbers look like. I don’t use my monthly net worth calculations for anything specific outside of ensuring the my financial decisions are continuing to increase my net worth. As you’ll see below I do it a little differently than some but its with the mindset of ensuring that each month we are taking baby steps towards our goals. The truth is my net worth doesn’t mean a whole lot right now. Three big pieces of my net worth are my retirement, my home equity and my HSA balance. Guess how much those help me if my car needs an expensive repair or my furnace goes out. So they aren’t liquid at all (I know, I know I could take out a HELOC but I don’t want to). However, the money that is sitting in those account does have a purpose it may just not be very liquid. I’ve got other assets that can help pay for short term emergencies like the ones I described above. 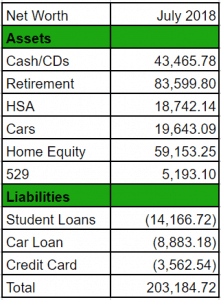 Here are some details on the different areas I take into account when calculating my net worth. I wish I had started tracking my net worth right when we got married but it took me a few years to get with it. 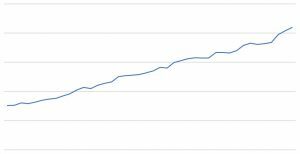 While I started tracking my net worth every month just a few years ago, its pretty easy to figure my net worth when I got married in June of 2011. Essentially its because we didn’t have a whole lot. Pretty cool to see all that work pay off. I’ll be honest, calculating my net worth each month is a pretty quick and boring affair. However, when I thought we had a shot to pass the 200k milestone I was pretty excited. Gosh I’m such a nerd. When I look back on the last 7 years I think I can boil down our success to a few things. Without a doubt the best thing we’ve done in our financial lives is pay down my student loan debt. We’ve paid off over 40k. We went at it hard out of the gate and slowed down when we started a family. It is not easy to put all that income into a savings account, let it build up to 10k or 15k and then call the loan company and send it all to them. However, it was necessary. I did that a few times with student loans and each time there was a few seconds of relief and then I was back at it. We’ve had so many things that have popped up that have been speed bumps on our journey like flat tires, car repairs, adding two little ones to our family, and the list goes on. With each one of them we knew it would slow us down. We stuck with it, Put our head down and worked hard every day. Its not easy putting together a budget every month for 7 years. Its not easy being the saver in the family and having to put together a plan that leaves us not doing things we want to do when there is so much cash sitting in savings. To reach our long term goals we had no choice. I’m not naive. I realize we’ve had a tremendous amount of good fortune. The most important thing is that myself, wife and children all have good health. You can take away everything I have and as long as my family and I still have our health, then things will be ok. Financially speaking we’ve had two good pieces of fortune. The first is the same thing that every other American has been able to take advantage of, the stock market surge. I was in college during the 2008 collapse. I graduated just as things were turning around. That means my retirement is a bit inflated. However, I do realize that I’ve been fortunate. I’ve never went back and looked at the returns on my investments but I’d guess they are doing pretty good. The second big thing was selling our first home for ~30% more than we paid for it after only 5 years. It turns out home prices were jumping up, especially for starter homes like we were in. We were in a position to move when we found that out and took advantage of the opportunity. Well there you have it. Adding 250k into my family’s net worth over 7 years took hard work, diligence and some good fortune. When it comes down to it I think the math is pretty easy. My wife and I have saved/paid off about $2,500 each month for 7 years. Add that up and you are over 200k. Add in some good fortune with our house and the stock market surge and you’ve got 250k. Like anything with personal finance, the math is pretty easy. The effort, planning, and work wasn’t. Nicely done! An inspiring story, and I’m sure looking back on it your inspiring yourself. A great self-lifting cycle! And I couldn’t agree with you more: without health, we have nothing. Thanks! Until this blog I really hadn’t went back and broke down the numbers and it was pretty gratifying to see the progress I had made. I couldn’t agree more about health as well. With it, I have everything. Without it, nothing else really matters. Thanks for the post! I love how honest and open you are with your finances! Most posts I’ve read on growing net worth just say: spend less than you earn. Easier said than done! Excited to continue to watch your numbers grow! Thanks so much for the kind words steph! I’m just constantly trying to pull things I’ve done and mistakes I’ve made to help everyone out. Keep doing it…the mindset is the right one!